So that's x4 Alonso jokers, x3 Verstappen jokers, and x1 each of Raikkonen, Button and Grosjean. Any more?! I would like to use my Group 1 joker on Lewis Hamilton. By my calculations that just leaves Mayhem, Jezza13, Black_Flag_11, Hamilton_Jar and Coulthard's Chin who have yet to use a joker in Hungary. Now that the leader I'm trying to catch has chosen the same joker, I'd like to scrap my Alonso joker please. I could pick Button instead but I'll save my group 5 joker for now. You all think you're so clever, with your McLaren jokers, and your Red Bull jokers... but what if I do... THIS?! Tier 6 joker on Romain Grosjean, please. Okay, so maybe you all knew what you were doing after all! The Hungarian Grand Prix saw F1's longest ever season move past the halfway point of the season and, as it did so, Lewis Hamilton took the lead in the WDC for the first time in 2016. The optimism surrounding Red Bull's potential to fight for a win faded as their two drivers spent the race never really looking like a threat for the victory, instead using the latter laps to successfully repel the Ferrari duo of Sebastian Vettel and Kimi Raikkonen. But what does all that mean for the Group Pick'em? And can Jenson's Understeer possibly get through this update without a single terrible Hungary/hungry joke? It's pretty doubtful! There are few things in life that are guaranteed, but next to birth, death and taxes comes the fact that a good weekend for Red Bull means the trio of Hamilton_Jar, Herb and TypingChicane will be fighting for the win. Hungary was no different, despite a whole host of jokers being deployed (more on that later!) as the top three in the Championship filled out the podium for the third successive race. While Herb may have taken victory in Silverstone it was TypingChicane who edged to the front this time, tying the Championship leader in taking their third victory of the year. A 136-point effort was only four points shy of a personal best, but was the late decision to pull the use of an Alonso joker a misstep? Only time will tell. As always, Herb wasn't far behind, claiming another strong result with a 129-point score. It's the first time we've seen someone score four successive podiums, and a sixth such result in seven races. Rounding out our familiar faces is Hamilton_Jar, who with a 124-point result perhaps may rue not using any jokers. Instead it's a fourth podium appearance without a victory, but certainly keeps them at the sharp end of the standings. While Herb, TypingChicane and Hamilton_Jar fight amongst themselves, the rest of us - we may as well be dubbed the 'Class B Championship' at this point! - were again left to scrap for the rest of the positions. Predictably, the sheer amount of jokers in use lead to a lot of us getting onto the right side of 100; the average score of 101.13 being just the third time (after Canada and Russia) where it has topped a century. It led to a crowded midfield battle as only 11 points separated the eight names from fourth through to eleventh. Icemanjee1 came out on top in that regard with a 112-point round, reaching triple figures for the fifth time this season. Next was Schumacher forever#1, posting a seventh 100+ score in 2016 with 110. Fountoukos13 and Jenson's Understeer were a further point back on 109, with theferret (107), Exediron (103), Remmirath (102) and Jezza13 (101). After two races without any jokers, did we ever make it for it in Hungary! A total of 11 were in-play when the race commenced, the majority of which were either for Max Verstappen (TypingChicane, Schumacher forever#1, Remmirath and coulthard's chin) or Fernando Alonso (theferret, Jenson's Understeer and Herb). 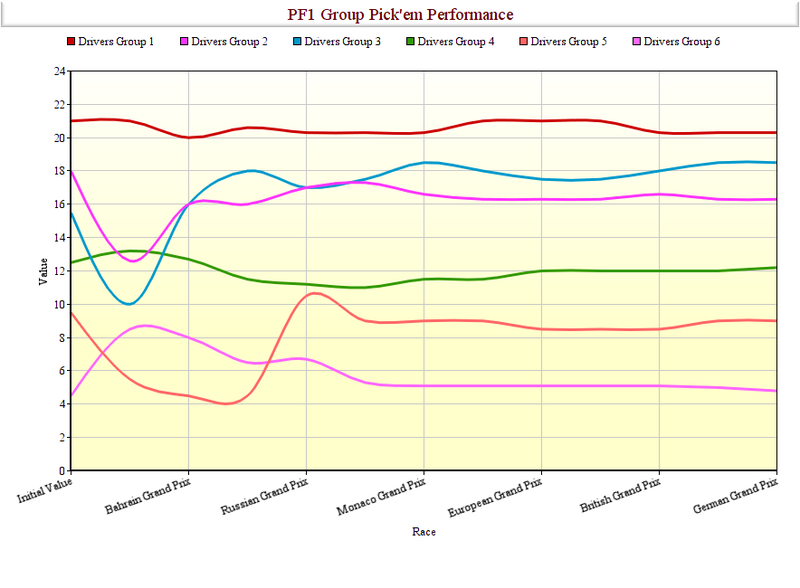 But it was Icemanjee1 who picked up the most bonus points, sensibly using their Driver Group 1 joker on Lewis Hamilton. Despite an uncharacteristic accident in FP2, and being unable to set a faster lap in Q3 thanks to Alonso's spin, the Brit still came out on top, bagging Icemanjee1 an extra 25 points. At the other end of the scale, Exediron took a risk on Romain Grosjean and came away with no points, the only one of the ten of us who used a joker not to pick up at least a point. The Max Verstappen joker may have been a missed opportunity, however. 10 points would not be the return those who used it would've hoped for, and indeed with Daniel Ricciardo finishing third, it wasn't even the maximum return from a Red Bull driver. Fernando Alonso, meanwhile, failed to repeat his fifth place from 2015, or indeed match the result he secured in Canada, but unless McLaren make a major step forward then you might think decent points hauls will be hard to come by. Mayhem, Black_Flag_11 and Hamilton_Jar have yet to use a joker. Fountoukos13. The only person to use two jokers in Hungary, the potential was there for a big points boost that might've resulted in just a second podium finish of the season. One went on Kimi Raikkonen, a decision quickly rendered unfortunate when the Iceman was the first driver to set his final lap in Q2 and spent the next 90 seconds tumbling down the order. While he recovered to sixth, eight points for a driver who has twice finished second isn't ideal. The other was burned on Jenson Button, which looked like it might at least result in some points after the Englishman made it into Q3. Instead Button was the only driver not to complete the race, whilst his teammate came home in seventh to nab six points, doubling the frustration for Fountoukos13. Two jokers resulting in eight points? You might say it left Fountoukos13 ...hungry... for what might have been. /Jenson's Understeer ducks as tomatoes are hurled onto the stage. Germany next, the last race before F1 goes off on its summer vacation. Will we see another round dominated by Herb, TypingChicane and Hamilton_Jar? Or will Daniel Ricciardo and Max Verstappen take each other out and give us a little variation in the result?! We shall find out soon! Last edited by Jenson's Understeer on Tue Jul 26, 2016 9:47 pm, edited 1 time in total. Thanks for that! Hamilton turning his season around has done the same for mine. Hate to be that guy, and I wasn't even intentionally checking, but TypingChicane cancelled his Alonso joker, but it's been included in his winning team score breakdown (and his Verstappen points aren't mentioned). Think the points are right though! Good spot! The funny thing is that I even specifically touched upon that in the write-up, then managed to forget a few lines later! I've edited that up now. As an aside, next season we'll definitely have a system whereby everybody is allowed a certain amount of selection changes over the season. I was against it before we began because I didn't want to see the people who made the smartest picks penalised by allowing those who didn't to change their mind, but having done half a season I can see I was wrong. Red Bull's resurgence, for instance, means we're probably going to see the same three people filling the podium in any weekend where Red Bull don't have a nightmare. We also all picked Ricciardo against Kvyat, but Verstappen's elevation might mean we'd get people switching from Daniel to Max, giving us more variation in the results. The jokers have helped but there is still a limitation there, and compared to the other games we have on here, I feel like this one doesn't require (nor receive) the participation those do. It would still be limited, although I've not really thought about how much so. Whether it would be x number of changes over the course of season, transfer 'windows' between certain races (which might be the best solution as it would ensure any advantage people have is maintained over a few races, but not over a whole season), or perhaps even another system entirely. Or it might be that I try and tie it into the jokers, something along the lines of we all have x jokers and y transfers, but the more transfers you use, the less jokers you get (and vice versa). Perhaps you could introduce a token system (just at a time when F1 will be scrapping it). Something like: you get 100 tokens. A team group 1 swap costs 50 tokens, a team group 2 swap 30 tokens, a team group 3 swap 25, and a team group 4 20. And then something similar for driver swaps, but with lower token costs, maybe 35 (group 1), 25 (group 2), 20, 15, 10, 5. If you'd want to have more game dynamic over the season, you could just increase the number of available tokens, so people could swap drivers just for a couple of races and the swap them back if they'd want to. I think in that case, the joker system needs to be scrapped; the game would be in danger of becoming too complex if you laid a new system on top of the current joker system. Anyway, just thinking aloud here. That's a good possibility as well. What I like about the joker system is it is quite straightforward: you get one for each driver group and that is that. Allowing everybody x number of changes in each group would be equally straightforward. Having x number of tokens and different amounts for different groups isn't as straightforward, although I'd like to think we're all smart enough to be able to understand it without too much confusion! But in that situation then I would have to seriously consider whether to have the joker system running alongside it, too. As you say, it really would start getting complex then. Whatever end up being the potential solutions I'll put to some kind of public vote, or at least a discussion to see what gets the most favourable responses. Although that'll wait until this season is over with so plenty of time yet! G#1 would still be considered a solid long-term investment, and has consistently offered a good chance of scoring maximum points with a joker. With Mercedes the best bet to win every weekend, this shows no signs of changing. G#2 was overvalued at the start and has never performed to expectations, but achieved its highest value before the Spanish GP. With Kimi Raikkonen currently providing most of the value for that group, investors holding on to it would be well advised to divest themselves of G#2 sooner rather than later - before Ferrari potentially lose out completely to Red Bull. G#3 was undervalued, but particularly since the Spanish GP has been outperforming the rest by a sizable margin. With Red Bull unlikely to go backwards, this group continues to carry probably the biggest growth potential of them all, with a decent chance of offering another win some time later in the season. G#4 has held steady, largely due to the declining fortunes of Toro Rosso being balanced by advances from Force India. After an early dip, the group has been trending upwards again, driven mostly by the steady gains of that team. However, one would have to conclude that its best days are behind it, with multiple podiums by Force India already past. G#5 has been on a greater upward trend than the chart shows, and carries possibly the best potential for future growth of any. This one would go solidly in the 'hold' category. G#6 is on a steady downward trend, and shows little hope for improvement. Grosjean's early season achievements artificially inflated the group, but reality is setting in once more. Anyone holding on to this group must be ruing not spending their joker on Grosjean early in the season. Special mention must go to the reigning Master of Jokers, Herb, who has so far managed to outperform the average value of the group with each joker spent. I was intending calculating Joker efficiency for everybody at the end of the season (if nobody else was doing it) - to see who performed best, I already know that my group 3 and 5 jokers were not used at their most efficient point - with Verstappen winning and Alonso getting a 5th I have only scored 24 out of a possible 35 from those groups (69%), fortunately, my group 4 joker pulls me up to 39/50 (78%). The biggest shock from the German result is that our top three is not only not some combination of TypingChicane, Herb and Hamilton_Jar, but in fact none of the three feature within it! ...did anyone actually believe that? Nope? Fair enough! Another good race for Red Bull ensures that our leading trio again fill out the podium places, giving us our fourth successive podium with all three present. In fact you have to go all the way back to Canada to find the last time none of them were in the top three. The variation this time? Having accumulated four previous podium appearances without winning a round, Hamilton_Jar finally gets the monkey off their back and wins a round! 134 points was good enough to edge overall leader Herb into second place by five points, with TypingChicane a remarkable eighth podium finish in third. Such was the dominance that the next nearest competitor finished nearly 20 points behind TypingChicane. It really does look like there are only three entrants who even stand a chance of winning at any given weekend, although a poor race for Red Bull - perhaps mixed with some well-deployed jokers - could yet challenge that statement. The Class B Championship - as this section is now fast being rebranded as - victory in Germany was actually shared between three different entrants: Fountoukos13, Jezza13 and theferret, all scoring a respectable 103 points. Nobody else stumbled over the century mark with Schumacher forever#1 coming closest, posting 98 points. Nobody had a particularly terrible round as demonstrated by most scoring at least 90 points. For perhaps the first time in 2016, nobody really stands out as an obvious candidate in this section. There wasn't one particularly bad performance, nor did anyone miss out on a strong result by not using a joker. In fact, nobody even had a joker go badly wrong. It's hard not to just put everyone who isn't Hamilton_Jar, Herb or TypingChicane here, though! Despite again being pipped to the victory, Herb is able to extend their lead at the top of the leaderboard courtesy of TypingChicane finishing third, adding a further eight points to the advantage and running it up to 54. Hamilton_Jar's victory means we now have a tie for second. The gap back to the best of the rest, which remains Jezza13, is getting dangerously close to 100 points. The standings as a whole continue to be rather static, with only a couple of minor movements: Icemanjee1 drops out of a tie for seventh; Jenson's Understeer drops out of a tie for ninth; and at the bottom, Remmirath outscores fellow backmarker Black_Flag_11 by nine points to move off the foot of the table by a single point. As an added bonus, here are our scores for each round so far, as well as everybody's average and the average score from the round. The score in bold is your high score for the season whilst the gold/silver/bronze represent podium finishes. All right! Time to enjoy not being dead last until the next race! It's interesting to see the individual scores for each race all in one place like that. It certainly rather brings home that the only time I've really done well is when Mercedes encounters misfortune, which is no surprise considering certain dubious choices I made at the beginning of this season. Spain and China seem to have offered the most varied scores thus far; I guess that's what happens when things get shaken up at the top end. The joker use analysis is neat, too! Removing jokers from the equation, the most points anyone has scored from their selections is Herb's 1309. That equates to 96.7% of the available points, which is equal parts ridiculous and impressive! Our current joker leader is Herb with 39 points, but that doesn't really tell the whole story since nobody has used all their jokers yet. Aside from those who have yet to use one, only Icemanjee1 and Jezza13 could theoretically still score the maximum points available from the jokers. They've only used their DG1 joker, and both scored 25 points from a Hamilton victory. So if their other jokers at the very least equal the best result in that group then they would pick up the maximum bonus points. That, of course, assumes we will see another 5th place from DG6, for example, which is far from guaranteed. Everybody else has already dropped points with at least one of their joker selections. Which I think is a demonstration of how difficult it is to perfect the joker scores; two of the groups only had two races in which the maximum for the season has been achieved, and three of them (DG3, DG5 and DG6) have had a single race high! I'm going to get the joker ball rolling for Spa and use my DG4 joker on Sergio Perez. Although I'm a little wary of his engine going kaput, can I play my group 1 joker on Hamilton please? Group two joker on Kimi Raikkonen, please! G3 joker on Ricciardo thanks. If Hamo doesn't take a penalty, please cancel joker. Last edited by Jezza13 on Thu Aug 25, 2016 10:32 pm, edited 1 time in total. "Always believe you will become the best, but never believe you have done so"
G2 joker on Raikonnen please. As long as we're all throwing jokers around, I'll have two please: Rosberg and Grosjean. Aaand my result for this race went straight to the pits at turn one. Yeah, the joker curse has clearly struck again... at first I was rueing failing to enter a Pérez joker (forgot the deadline was FP1), but maybe I'm actually better off this way! In spite of Vettel, Raikkonen, Hamilton and Verstappen all being forced to fight their way back through the field, the Belgian Grand Prix saw this little game produce its highest average score (111) for a race so far. In the spirit of the Olympics, would Herb, Hamilton_Jar and TypingChicane continue to 'own the podium' or would the somewhat jumbled finishing order - combined with a couple of well-deployed jokers - mix things up a bit? Let's find out! Schumacher forever#1, perhaps fittingly given their username and the fact the man himself arrived on the F1 scene in Belgium, stormed to victory with an impressive score of 143 points. It's a season-high for Schumacher forever#1, as well as their first podium appearance in seven races, and a second victory of the season. Following closely behind - and also posting their personal best for the year - is Coulthard's Chin, bagging 139 points for comfortably their best result of 2016. And making their sixth podium appearance - and first since the Austrian Grand Prix - is Jezza13, who with 138 points only just misses out on second place. Jokers played a big part in the result but more on that later! Having been held off the podium for a change, Herb, Hamilton_Jar and TypingChicane can at least take consolation in the fact they were the best of the rest, with Herb and Hamilton_Jar sharing fourth and TypingChicane following closely behind. After our leaders came Icemanjee1, who became the fourth entrant of the weekend to record a high score in Belgium, totally 122 points. The high-scoring round saw four more competitors score strongly: Fountoukos13, theferret and Mayhem, who all claimed a score of 120, as well as Black_Flag_11, who added an extra 1 to their username by scoring 111 points. The less said about the other three scores the better! We were back to seeing multiple jokers used and the success rate was... varied, to say the least! Schumacher forever#1 and Coulthard's Chin made very good use of their group 1 joker, employing it on Nico Rosberg and coasting to an easy extra 25 points. Mayhem, Black_Flag_11, Herb and Hamilton_Jar - all still to use their G1 joker - might well have missed a trick at a race where it seemed like there was only ever going to be one winner. It helped turn average weekends into visits to the top two steps on the podium for both. Also using their G1 joker on Nico Rosberg was TypingChicane, a move that worked well to rescue what would've been a first sub-100 score in five races. However, TypingChicane also saw their G6 joker - deployed on Romain Grosjean, a man who has seen both the good and bad of Spa - result in no extra points. Kimi Raikkonen proved to be an attractive joker option as both Exediron and Herb looked for the 'Spa specialist' to bag them some serious extra points. With Lewis Hamilton seemingly out of the reckoning and the Spa track perhaps foreseen as one where Red Bull's recent resurgence might be halted slightly, it could've been a good call. Any such thoughts would've lasted no more than ten seconds on Sunday afternoon as Kimi found himself sandwiched between Vettel and Verstappen, suffering a puncture and immediately falling a lap down. All-in-all it meant a bonus of a mere two points for both. The two other jokers used for the weekend were by Jezza13, who wisely predicted Daniel Ricciardo would have a strong weekend and collects an extra 18 points - again, enough to ensure an appearance on the podium - and Jenson's Understeer, who bet that Force India would again be strong at Spa and that Sergio Perez would be in the hunt to equal his best result of the year. As it happened it was his team-mate, Nico Hulkenberg, who flirted with that elusive first podium, right up until Kevin Magnussen reminded us that Eau Rouge is still a corner to be reckoned with, bringing out a red flag that gave Lewis Hamilton a path to third. I think that's a pretty apt summary of events! Exediron and Herb probably deserve a shout-out, too, for their wasted Kimi Raikkonen jokers. With none of our leading trio making the podium there could've been the opportunity for things to be shaken up a little at the top. As it was, that didn't really happen. Herb and Hamilton_Jar scored the same and therefore the gap between first and second remains static at 54 points. TypingChicane drops out of a tie for second but is only nine points back on Hamilton_Jar. Jezza13 and Schumacher forever#1 are able to close in a little on the top three but realistically would need several more weekends like that to completely bridge the gap. No movement in positions four through nine but Coulthard's Chin looks to have been the big winner, climbing two places courtesy of a strong podium finish. Jenson's Understeer loses a single place for the second round in a row but is at least now 17 clear of Exediron, having made the same selections but benefitting from superior joker usage. Meanwhile Ferrari's disastrous first corner sees Remmirath reclaim last place, once more swapping positions with Black_Flag_11 in what seems to be a pretty spirited battle not to claim the wooden spoon! Jenson's Understeer loses a single place for the second round in a row but is at least now 17 clear of Exediron, having made the same selections but benefitting from superior luck. Italy: jokers on Perez and Wehrlein please! Predicting a good showing from FI in Italy. Problem is what driver to plum for. G4 Italian joker for the Hulkmeister thank you. Anyone else who wants to use a joker has approximately 22 hours and 30 minutes in which to do so. I'd like a Raikkonen joker please.